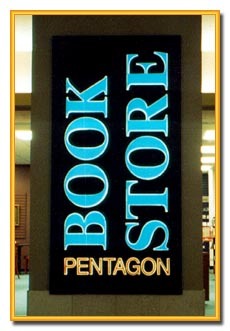 Push-Through lettering is a variation of an illuminated light box. The box body is precision cut to match the lettering or logo, which is then fit into the holes, either flush or partially exposed (from the side). The front of the lettering or logo is generally covered by translucent (as in the above picture) or solid covering, allowing light to escape from the sides. Inlaying 2 different materials into a sign or display is another use of this process.